Constituted as the 451st Bombardment Group (Heavy) on 6 Apr 1943. Activated on 1 May 1943. Prepared for combat with B-24's. Moved to the Mediterranean theater, Nov 1943-Jan 1944, with the air echelon training in Algeria for several weeks before joining the remainder of the group in Italy. 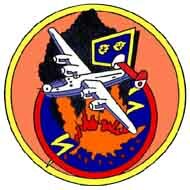 Operated with Fifteenth AF, Jan 1944-May 1945, functioning primarily as a strategic bombardment organization . Attacked such targets as oil refineries, marshalling yards, aircraft factories, bridges, and airfields in Italy, France, German and Czechoslovakia, Austria, Hungary, Rumania, Bulgaria, Albania, and Greece. Received the DUC for each of three missions: to an aircraft factory at Regensburg on 25 Feb 1944, to oil refineries and marshalling yards at Ploesti on 5 Apr 1944, and to an airdrome at Vienna on 23 Aug 1944; although encountering large numbers of enemy fighters and sever anti-aircraft fire during each of these missions, the group fought its way through the opposition, destroyed many interceptors, and inflicted serious damage on the assigned targets. At times the group also flew support and interdictory missions. Helped to prepare the way for and participated on the invasion of Southern France in Aug 1944. Transported supplied to troops in Italy during Sep 1944. Supported the final advances of Allied armies in northern Italy in Apr 1945. Returned to the US in Jun 1945. Inactivated on 26 Sep 1945. The total tonnage dropped by the 451st was not the highest in the 15th AAF, however the 451st Bomb Group achieved the highest overall bombing score in the 15th AAF. The 451st Bomb Group was the only group in the entire European Theater to achieve an non-disrupted perfect mission. The 451st Bomb Group was one of the most highly decorated groups in the 15th Army Air Force. The 451st Bomb Group was also one of the most battered. In 216 missions 135 B-24s were lost.